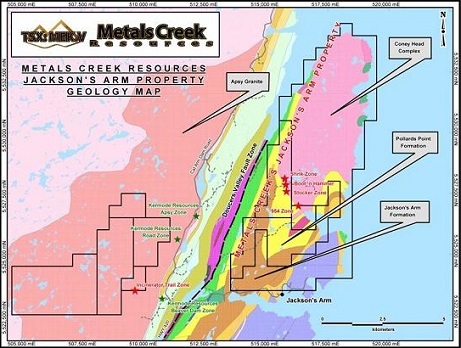 Metals Creek Resources has established a significant land package to explore for Bulk tonnage gold deposits in north-central Newfoundland. The Jackson's Arm property consists of 246 staked claim units totaling 6150 hectares, owned 100% by the company. 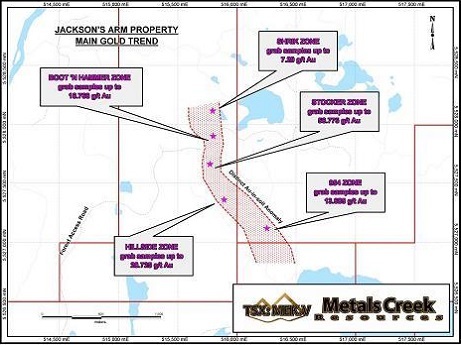 Located on the western side of White Bay, the newly discovered gold zones are located adjacent to Kermode Resources’ Jackson’s Arm Property which contains a NI 43-101 Inferred Mineral Resource of 18,300,000 tonnes at 0.84 grams per tonne gold or 495,000 ounces gold,(REF: Kermode Resources(KLM) news release, April 14, 2009) and 27.5 kms northeast of Northern Abitibi Mining Corp’s Viking deposit which contains a NI 43-101 compliant resource estimate containing 131,511 ounces of gold (REF: Northern Abitibi Mining Corp (NAI) news release March 2, 2011). The property is proximal to excellent infrastructure including a paved road and power line. 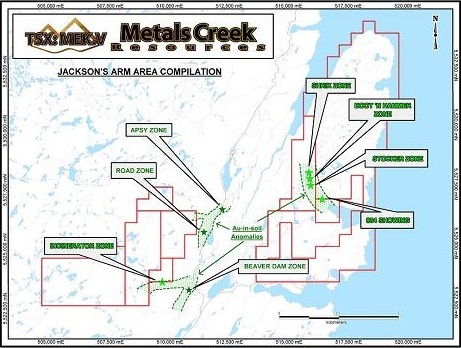 Exploration at Jackson's Arm has identified gold mineralization over four main areas. The Boot n Hammer Zone described as quartz veins and stringers over a large area within an altered granodiorite with mineralization consisting of 2 -10% disseminated pyrite both within quartz veins and the granodiorite intrusion. Assays range from 5ppb (parts per billion) to 24,653 ppb with 46 percent of the 50 samples taken assaying greater than 100 ppb with the majority of the better assays occurring within the quartz veins and stock work. Silver analysis is also up to 170 g/t at the Boot n Hammer zone. The Shrik Zone is located approximately 100 meters north of the initial discovery (Boot n Hammer Zone), and is described as quartz veins, up to 4 meters wide, and stringers within an altered granodiorite. The mineralization consists of 2 -10% disseminated pyrite within both the quartz vein material and the granodiorite intrusion. Assays range from 5ppb (parts per billion) to 7,290 ppb gold with 45 percent of the 22 samples taken assaying greater than 500 ppb with the majority of the better assays occurring within the quartz veins and stock work. 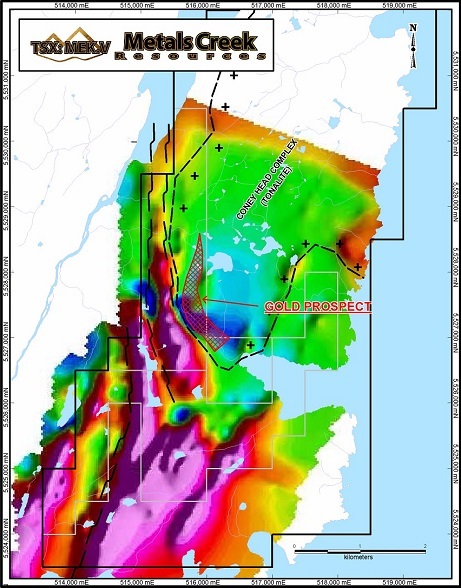 A third zone (The Stocker Zone) is located approximately 400 meters south of the Boot n Hammer zone and is described as a large zone of quartz flooding (95 meters by 35 meters) with 1-10% disseminated pyrite. Assays from the Stocker Zone range from 5ppb to 56,779 ppb with 58 percent of the 38 samples taken assaying greater than 1300 ppb. The 954 Zone is the fourth zone and is located approximately 700 meters southeast of the Stocker Zone. This discovery is described as an area of quartz stock work and veining with assays ranging from 5ppb to 13.6 g/t gold proximal to the contact of the granite intrusion. 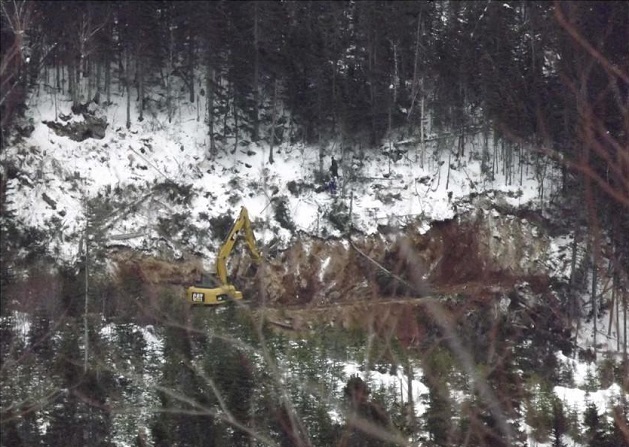 A trenching and prospecting program has recently been completed and sampling is continuing on the claims along with a soil sampling survey being initiated. A large portion of the granodiorite intrusion remains largely unexplored. Management is highly encouraged to find new gold mineralization in an area very close to known gold resources.